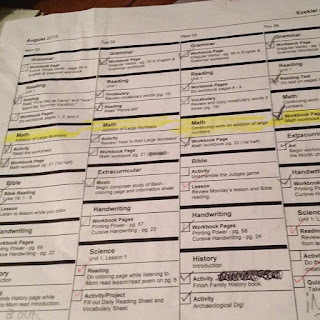 In the 6 or so years we've been homeschooling, I've tried a variety of different planners to keep track of the kids grades, classes, and assignments. I've had some that worked out okay and others that didn't work at all. I tried buying them online from homeschool companies, assembling my own with a store bought planner, or piecing together printable ones from online. So many of them were filled with all sorts of extra pages that were overwhelming or that I didn't even use. I needed something simpler and easy to use. When I began gearing up for this year I found an online lesson planning tool through a Facebook group I'm in. I thought eh, I'll sign up for it and see what it's like. I was very pleasantly surprised! 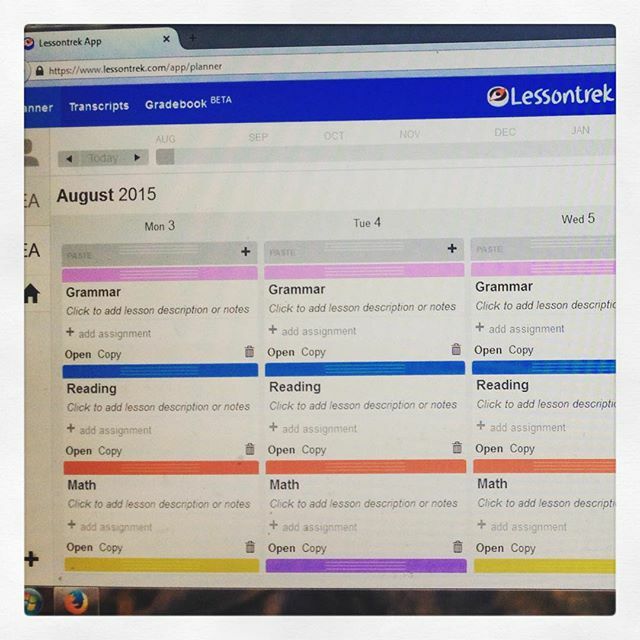 LessonTrek is a very easy to use online lesson planner. It's available for Chrome, Safari, Firefox or IE 10+. In addition to yearly lesson planning, it also comes equipped to record grades and assemble transcripts. I plan out a week or two weeks at a time and then print off a copy of the week's assignments for the children to attach to a clipboard and mark off assignments as they go. It gives them a little more freedom and responsibility and lets them know exactly how much they have to get done that day. Adding and arranging subjects is very easy. 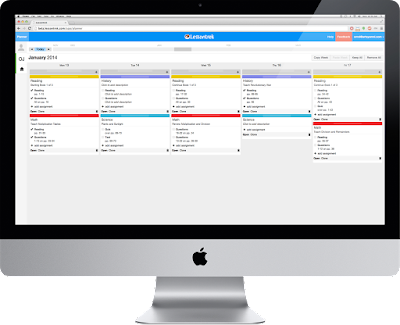 LessonTrek uses a very simple drag-and-drop interface that gives you room to put information about the assignments and different types of tasks - tests, workbook pages, reading, etc. You can also copy and paste whole weeks at a time - which I've found to be helpful since we do the same subjects each week. 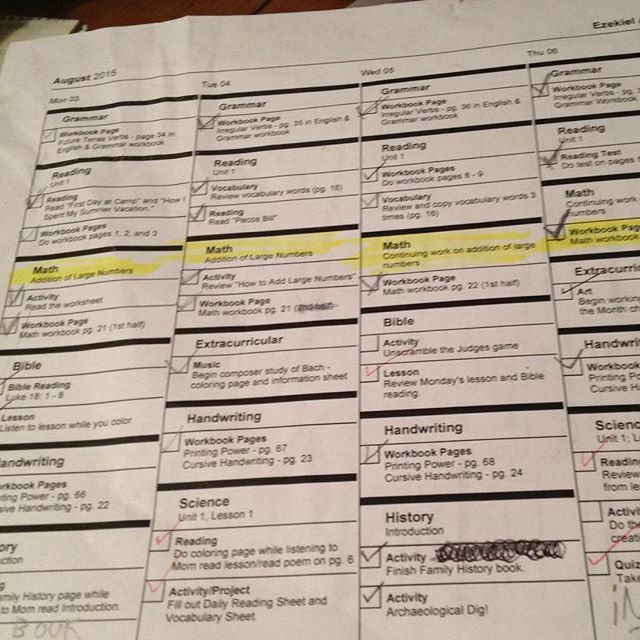 I can fill in all the subjects and then just copy it to the next month or two and then fill them out as needed. Grading subjects is also very easy with LessonTrek. You can use percentages, incomplete/complete, points, symbols, or leave the subject ungraded. Field trips and extracurricular activities can also be added in. I added our weekly Book Club and then in the blank space underneath their assignments the kids will fill in other tasks or events that are happening throughout the week. I sent a message to the people who created LessonTrek and let them know how much I loved it and asked a few questions about a few different features. They were quick to respond and let me know that one of those features in particular (sharing subjects between students) was in the works and would be available soon. Very quick and helpful customer service! They also very generously gave me information about a current special that my readers could use! 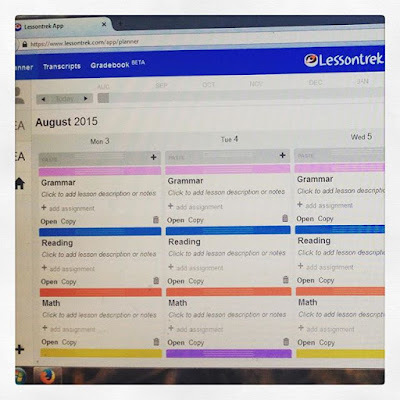 LessonTrek has a 14 day free trial and normally costs $6 a month or $60 a year. (Still really good for all the stuff it offers!) But by using the special code below, you can get 50% off for 2 years. Just enter code HC243 inside the Monthly Code section Discount Code box in all caps. You'll only have to pay $3 a month for 24 months! That's a really great deal. Disclosure: I emailed LessonTrek of my own accord to tell them how I liked their service and to ask questions. I also told them I was a blogger who thought her readers would also like their service. They offered my readers a discount code. I received no compensation and these opinions are all mine!